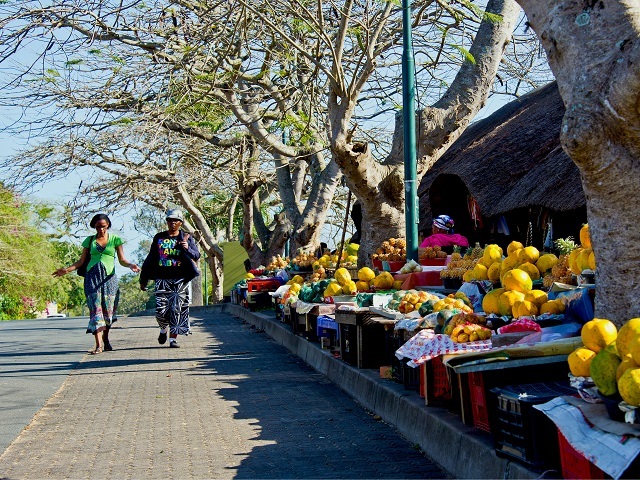 A street market in St. Lucia, South Africa. With the continent rapidly urbanizing, it’s critical that city leaders address urban food loss and waste in order to ensure sustainable development and end food insecurity. Photo by Steve Slater/Flickr. Last year, the African Union—an assembly of 54 African nations—formally committed to ending hunger in Africa by 2025. This is incredibly ambitious, considering one out of every four people in sub-Saharan Africa is undernourished. The majority of the 800 million people worldwide who are food insecure live in emerging economies and hunger is often overlooked in developed countries like the United States, where a relatively small proportion of the population is consistently food insecure. Food insecure communities often face poverty, and suffer from a lack of financial resources, infrastructure, and access to food. For example, in Ghana, more than 45 percent of the population lives on less than $1.25 per day and cannot afford basic necessities. Cutting down on food loss and waste (FLW) can help not only combat hunger in insecure communities, but also make cities more sustainable. While the majority of FLW in sub-Saharan Africa currently does not come from consumers in cities, the continent is rapidly urbanizing—putting strains on the capacity of cities to adequately feed residents in a sustainable way. Therefore, it is crucial that city leaders develop solutions for reducing FLW at both the consumer and agricultural levels. 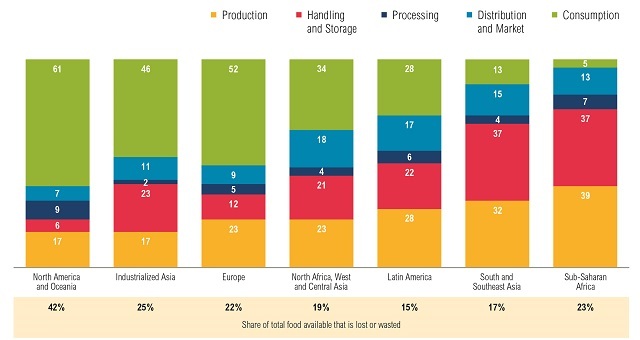 Where Does Most Food Waste Come From? One of the ways that the African Union aims to achieve this ambitious goal is by halving postharvest losses (PHL). PHL are a contributor to global food waste, which amounts to a staggering one-third of total food poundage produced. PHL occur at the handling, storage, and transport stages of the food system and include spillage and degradation of both produce and animal products. Cutting down on PHL is an effective strategy for improving the efficiency of food production as well as making food more accessible and available—particularly for those living in sub-Saharan Africa. Given the prevalence of PHL in Africa, programs and policies that target the beginning of the supply chain are especially important, and many organizations are already dedicated to finding solutions. The African Postharvest Losses Information System (APHLIS) works to collect data on postharvest grain losses, and is an invaluable source of open data for investigating the sources of food system inefficiencies. Additionally, WRI’s working paper on food loss and waste points to new technologies such as evaporative coolers and crop plastic bags as innovative solutions for loss at the storage level. However, targeting postharvest losses alone is not enough. Currently 40.4 percent of the Africa’s population lives in urban areas and that number is predicted to increase to more than 45 percent in 2025. As people continue to move into denser urban areas, it is likely that a smaller percentage of the population will be involved in agriculture, shifting the sources of food waste. Food waste and loss shifts away from the production stage and to the consumption level as cities and countries develop. Graphic by World Resources Institute. Despite the significant amount of FLW in both developed and developing regions of the world, it’s important to distinguish the sources in each. In industrial, developed, and highly urban areas of the world—such as North America and Oceania—FLW occurs mostly at the consumer level. Consumer level loss is food purchased by consumers and restaurants that is ultimately not eaten. 61 percent of FLW is generated during consumption, whereas in sub-Saharan Africa, 76 percent is generated during production or handling and storage. Reducing postharvest losses will be key for addressing hunger and increasing food security in sub-Saharan Africa, but it’s important to recognize that food waste and loss affect the food system throughout the region. In southern Africa, urban areas account for more than 60 percent of the population, which is higher than the global average. As urban populations continue to grow and incomes rise, it is likely that some of the FLW will shift from PHL to consumer level losses. Therefore, it’s crucial that sub-Saharan African cities develop food waste policies and programs in anticipation of an urbanized continent. Several sub-Saharan African nations are already developing innovative, consumer-level solutions. FoodBank South Africa rescues and redistributes almost 13 million meals annually. On a smaller scale, the Cape Town-based company AgriProtein uses insects to recycle nutrients, estimating that for every ton of their fishmeal product produced, $2500 is saved from the reduced environmental impact. Similarly, a community in Dakar, Senegal has developed a communal micro-gardening, compost, and waste management system. Projects to combat food waste at the local level are also in the works in other countries, including Ghana and Tanzania. Regardless of the African Union’s goal of ending hunger by 2025, food loss and waste will continue to challenge urban communities. Therefore, cutting down on FLW in sub-Saharan Africa is critical for not only ensuring sustainable urban development, but combating food insecurity across the region.